If you didn’t already know, we’re BIG fans of the Wholefood Medicine Man, Don Tolman. 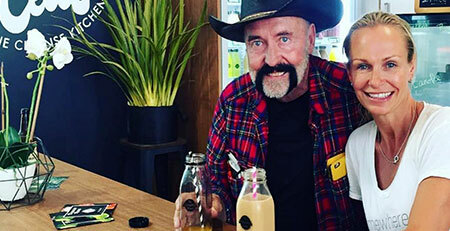 You may or may not know that in our ‘other business’ life, we work closely with Cowboy Don Tolman, promoting his events in Australia and his Self Care products online for distribution globally. Last week we left our beloved juice kitchen in the very good hands of our team as we travelled the country with Don, sharing with more than 3,000 people the benefits of ‘self care’ and plant wholefoods as medicine. Our work with Don was our key inspiration for creating the The Cleanse Kitchen. Over the years we’ve seen time and time again the healing power of fasting and the impact that embracing living juices and wholefoods has on people’s health. We wanted to create premium bottles of living juice (what we refer to as “liquid sunshine”) so that it was easy for people on the Gold Coast to access and experience it’s benefits on a daily basis. You CAN heal yourself from all kinds of sickness and dis-ease with whole foods and juice fasting or cleansing. And at the very least, there’s nothing better that you can do for your health than start your day with a fix of cold pressed, living juice – before you put anything else into your body. Going on the road with Don for a huge national tour breathed so much new life into our work and we’re more inspired than ever to continue spreading the powerful message of Self Care. Now we know this may sound a little funny when you first hear it, but each whole food resembles and targets a part of your human body. This wisdom relates back to “The Doctrine of Signatures” that contends that plant foods each contain a pattern or ‘sign of nature’ (Signature) that resembles a body organ or physiological function. It also states that this pattern acts as a signal or sign, as to the benefit this particular food provides the individual who consumes that food. This study reaches all the way back to Roman times where it was called the “Law of Similarities”. For example, an Avocado looks like a womb with a swollen seed inside just like a woman who is pregnant. And astoundingly, it takes 9 months for an Avo to grow from blossom to ripen fruit. And today it’s been scientifically proven and makes complete sense, that the ‘good’ fats contained in Avos are great for the health of the feminine reproductive system. Slice a carrot and it looks just like the human eye. You’ll see a pupil, iris and radiating lines. And it’s backed by science that today shows that carrots greatly enhance blood flow to and function of the eyes. The list goes on…it’s so fascinating when you learn about every food. With medical science muddying the waters and turning health care into a massive industry, being healthy is made out to be confusing and complex. What we learned from Don is that the 7 principles of health that revolve around, fresh AIR, clean WATER, SUNSHINE, WHOLEFOODS, WALKING, NON-TOXIC RELATIONSHIPS and PASSION are as simple as it gets if you want to live a happy, healthy, dis-ease free life. 3. The fastest way to heal is to FAST! “Fasting has existed since the beginning of life on earth. An ill or injured animal’s first instinct is to abstain from solid food until it is again healthy. They instinctively know that the healing process will be much faster and more effective when it abstains from solid food that will burden its digestive tract. This instinct has always existed within the animal Kingdom. The human body also has this same instinct, for it is common for most people to stop eating when illness strikes. Put simply, fasting allows the body to direct all its energy to healing”. Yikes, it makes me want to do a juice cleanse right now! There’s no doubt the self care revolution is really here. After an exhilarating week away, we’ve come back to The Cleanse Kitchen and have this week been pouring our hearts into our amazing bottles of juice. Thankyou for sharing this journey with us. Inga & The Cleanse Kitchen x.